The Spring Festival Gala, the world's most watched show of the year, will use advanced technologies this time around such as 5G, virtual reality, augmented reality and artificial intelligence, to provide a more immersive and interactive experience for audiences across the globe. 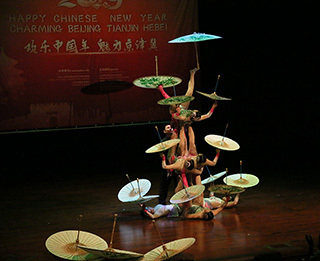 The Spring Festival Gala hosted by CCTV was first held in 1983 and has become a tradition for Chinese people celebrating Lunar New Year's Eve. An arts troupe from China's northwest Shaanxi Province on Saturday fascinated hundreds of revelers with a spectacular show in Uganda's capital Kampala. Beijing-Tianjin-Hebei region hosted a "Happy Chinese New Year" celebration event in Bridgetown, Barbados, on Jan. 22. "La Traviata," the renowned opera by Giuseppe Verdi, has been staged at the National Center for Performing Arts (NCPA) as from Jan. 19. China has launched an annual "Happy Chinese New Year" global celebration campaign as the 2019 Spring Festival draws near. Acclaimed Kunqu Opera actress Liang Guyin may be 77 years old, but she will soon return to the stage to play the role of a character.